A new study, to be published in Current Biology* on 28 June, proposes new strategies to induce the collapse of bacterial populations, by manipulating social interactions in the human pathogen Pseudomonas aeruginosa, a bacterium that causes chronic lung infections. A research team led by Karina Xavier, from Instituto Gulbenkian de Ciência (IGC, Portugal), identified novel ways to promote so-called "cheating behavior" in bacterial communities that can lead to the collapse of the bacterial population, simply by manipulating the chemical composition of the environment. Similar to human societies, bacteria live in communities and interact with each other in order to better adapt to the environment. Regularly, they produce compounds which behave as public goods , as they are secreted to the surroundings and are consumed by the entire population, benefiting the whole bacterial community. However, some bacteria carry mutations that prevent them from producing those public goods. These bacterial mutants act as cheaters, benefiting from the public goods without contributing to their production. "Much like human societies, bacterial populations have cheaters. Citizens that do not work but rely on the social benefits provided by tax payers profit from all the benefits that taxes cover, without paying the cost. If many citizens cheat, the entire economic system collapses. The same thing happens with bacteria. Bacterial cheaters profit from goods produced by other bacteria without contributing. Because cheating allows them to save energy, they can grow more and faster. Ultimately these cheaters may outnumber those bacteria that produce compounds leading to the extinction of the population, since public goods will no longer be sufficient to everyone," explains Özhan Özkaya, first author of this study and a PhD student at Karina Xavier's laboratory at the time this research was being conducted. It was known that the bacterial population could collapse in the presence of a cheater. But in nature, in an infected organism, the bacterial population may include various mutants that are deficient in the production of a different compound. So, what happens if other cheaters are playing the same game? To investigate these social interactions, the IGC research team used Pseudomonas aeruginosa, an opportunistic pathogenic bacteria that infects lungs and is commonly found in cystic fibrosis patients. Chronic infections caused by these bacteria often contain various bacterial mutants. 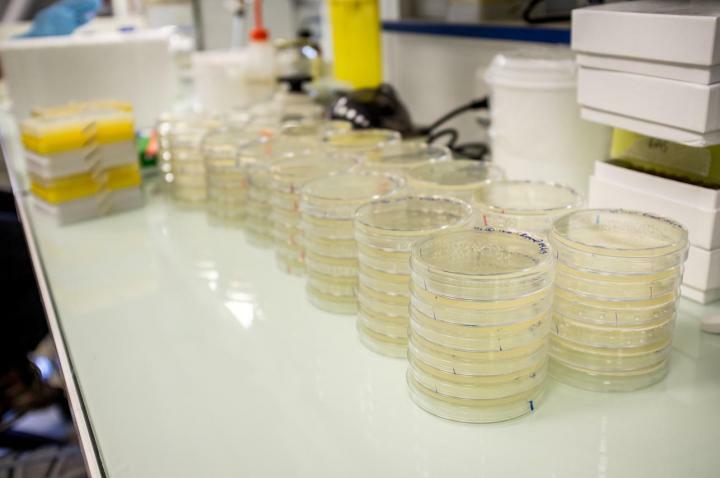 Xavier's team used test tubes and petri dishes to grow normal Pseudomonas aeruginosa and two different mutants that failed in the production of two different public goods. They observed that interactions between those two mutants and normal bacteria could prevent the population collapse. "Our results show that when cheaters cheat on each other, the population collapse that could be caused by one cheater can be prevented, and the population can remain stable for a longer time. Well, that can be very good from the point of view of the bacteria, but bad news if you want to clear an infection by a nasty pathogen", says Özhan Özkaya. To be able to predict how to change the fate of bacterial populations with different cheaters, the researchers created a simple mathematical model. Their results showed that in order to change stable interactions among the different cheaters and cooperators it is necessary to change the cost of producing the public goods. Again, Özhan and other team members in the Xavier Lab turned to their test tubes and petri dishes to show that by changing the nutrients given to the bacteria they could change the cost of these cooperative actions and lead a stable population to extinction. "In recent years we have advanced tremendously in the understanding of how bacteria interact with each other. This novel approach has allowed us to develop predictions and insights into how bacterial communities may gain or suffer from cooperation or cheating. In my opinion novel drugs that block bacterial social behaviors, possibly in combination with traditional antibiotics, will be more efficient in clearing infections and will be the solution to the problem of antibiotic resistance", says Karina Xavier. Contrary to what one e might initially think, theories from economics can contribute to understand the behaviors of communities of organisms other than humans. Researchers have been using concepts from economics to study bacteria social interactions. Two of them are the "Tragedy of the Commons" and the "Public Good Dilemma". According to theories based in economics, these concepts predict that human societies may suffer from individual choices that neglect the well being of the community in the pursuit of personal gain, namely when benefiting from a public good. This is what is observed in bacterial communities that include bacterial mutants deficient for the production of compounds that are used by the entire community. This new study from the IGC team exemplifies how such understanding can be used to establish strategies to manipulate bacterial pathogens.